All business premises and every block of flats must have a Fire Risk Assessment by law, yet not everyone understands this important fire safety measure. We are often asked the question ‘what is a Fire Risk Assessment?’. The fact is, your Fire Risk Assessment should be the cornerstone of your fire safety plans for your specific building. Unfortunately Fire Risk Assessments are often overlooked, which can lead to buildings being exposed unnecessarily to fire risk, sometimes with the potential for loss of life. You can read more about Fire Risk Assessments below, or otherwise please get in touch with our expert team if you would like to discuss the specific requirements for your building. 1. So, what is a Fire Risk Assessment? At the most basic level, it is a review taken of a building to assess it for fire risk, and to provide recommendations to make it safer if need be. A Fire Risk Assessment does not have to be written down if there are fewer than 5 regular occupants in a building, so a Fire Risk Assessment is not necessarily a document. However, we would always recommend having a Fire Risk Assessment written down, as this is the simplest way to communicate the findings and to make sure that the recommendations have been carried out. What are the legal guidelines around a Fire Risk Assessment? There are some specific guidelines concerning Fire Risk Assessments. Changes in the layout of the building, the use of it, or the type of occupant can make a big difference to your fire safety plans, so it’s important to conduct a Fire Risk Assessment review if any of these take place. 2. It must be written down if there are 5 or more regular occupants. If your business premises or block of flat usually has more than 4 residents at any one time, then you must legally document your Fire Risk Assessment. However, as already mentioned, we would always recommend having your assessment written down whatever the size of your premises. Whether written down or not, there are 2 parts to a Fire Risk Assessment that must be produced. One is the review itself, which will assess the fire safety of the premises against a number of points. The other is the list of recommendations which should be acted on for the building to be fire safety compliant. It is so important to act on these recommendations because ultimately this is what will keep your building safe. Who is responsible for making sure a Fire Risk Assessment is carried out? By law, every business and block of flats must have a designated ‘Responsible Person’, accountable for fire safety. It is the designated Responsible Person’s job to make sure the relevant fire safety duties are carried out and that action is taken to prevent fires happening, and also to prevent injury or death if a fire does actually happen. It is therefore the Responsible Person who should make sure your building has a valid Fire Risk Assessment. If you are a small business owner, you are generally the Responsible Person for your premises, unless you have nominated someone in your team. If you are a resident in a block of flats or tower block, then the Responsible Person is typically the landlord or managing agent, although they may also be a member of the Residents’ Association. In blocks of flat the Responsible Person is only accountable for the common areas, such as corridors and stairwells. It is up to the resident to make sure their own flat is fire-safe. How can I get a copy of my building’s Fire Risk Assessment? It is absolutely your right as an occupant of a building to have access to your premises’ Fire Risk Assessment if you choose. Your first port of call should be the Responsible Person for your building. If you’re not sure who this is, then the business owner, the facilities department, the landlord or managing agent would be good places to start. If you find that your building doesn’t have a valid Fire Risk Assessment, then you should request that your Responsible Person has one carried out as soon as possible. If you feel that you are not having your concerns treated seriously by your building’s Responsible Person, then, as a last resort, you could get in touch with your local fire brigade. However, please don’t contact the fire brigade with trivial concerns, they are busy people. And of course, do not use the 999 emergency number! You will be able to find your local fire brigade’s general enquiries number on the internet. What gets reviewed in a Fire Risk Assessment? Fire Risk Assessments should be comprehensive and take into account many different fire risk factors. The level of detail in an individual review will depend to a large extent on the complexity of the building. For example, a ‘single-compartment’ building, such as a small shop or kiosk, will have far less to review than a large office block, or even a block of flats. Legal guidelines state that a Fire Risk Assessment can be carried out by a ‘competent person’. This does not necessarily mean you have to use a qualified Fire Risk Assessor. However it does mean that whoever carries out your Fire Risk Assessment should be comfortable assessing your premises against all of the factors listed above. For all but the most simple of premises, we would really recommend using a professional Fire Risk Assessor. Professional Fire Risk Assessors undertake a lot of very detailed training and will be fully versed in the latest legal requirements and guidelines, including how to apply them to different types of building. What is the penalty for not having a Fire Risk Assessment? The penalty for not having a Fire Risk Assessment and, in particular, not having implemented the correct fire safety precautions, is prosecution resulting in severe fines, or in cases of extreme negligence, a prison sentence. 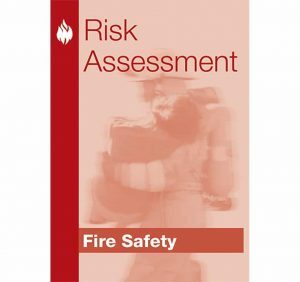 We hope this guide explaining ‘what is a Fire Risk Assessment?’ has been useful to you. If you would like to talk to our expert team about your business premises, tower block or block of flats, or if you would like to book a Fire Risk Assessment from one of our expert assessors, please call us on 0845 845 3001, or email us at info@surreyfire.co.uk.